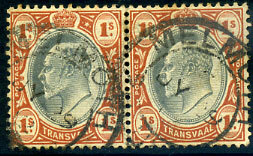 skeleton dated 5 NO 1934 on block of four 1d (SG.56), corner perf. fault. (M.2) MR 16 1903 on horiz. 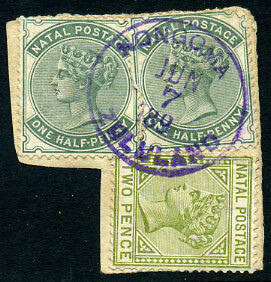 pair KE7 1/- (SG.136), some perf. splitting and creased etc. (Z.9) MR 3 96 on QV 1d (SG.21). 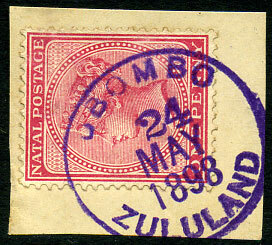 (Z.6) in purple ink dated 26 APR 1898 (LRD, the "26" inverted) on Natal QV ½d (SG.97a). 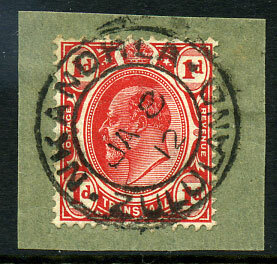 (Z.6) 18 OCT 1895 on QV 1d (SG.21). 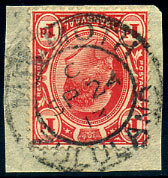 (Z.6) 9 NOV 1895 on QV 1d (SG.21). (Z.10) AU 4 02 on Natal QV 2d (SG.107). 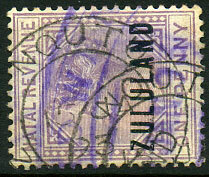 (Z.4) in purple part dated 30 MAY ---- on GB ovp'd QV ½d (SG.1), slight toning. (Z.12) MY 26 190(0?) on Natal QV 6d (SG.103). 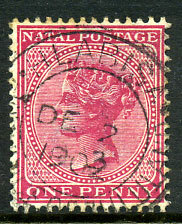 (Z.2) 21 SEP 94 on Natal ovp'd QV 1d dull mauve (SG.F1). 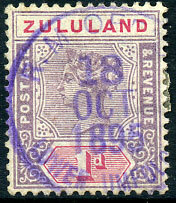 (Z.7) in purple with SIDEWAYS DATE OCT 12 1897 on QV 1d (SG.21). Nearest normal dates are OCT 8 1897 and NOV 9 1897; inverted date found for NOV 8 1897. 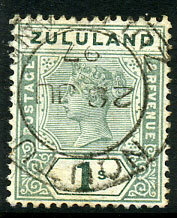 (Z.2) dated FEB 1 89 on GB ovp'd QV 1d (SG.2). 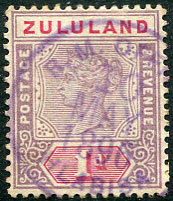 (Z.7) in purple dated JAN 11 189(8) on QV 1d (SG.21). 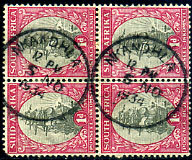 (Z.7) in purple dated JUN 7 189(8) on Natal QV ½d x 2, 2d (SG.97a, 106) piece. 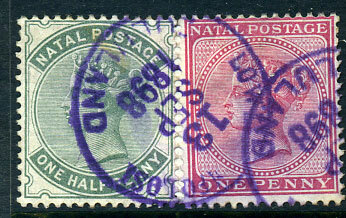 (Z.7) in purple dated 18 JAN 1898 on pair Natal QV 1d (SG.99a), some toned perfs. 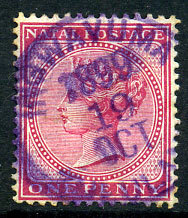 purple ink TRD dated 12 APR 1896 on QV 1d (SG.21). 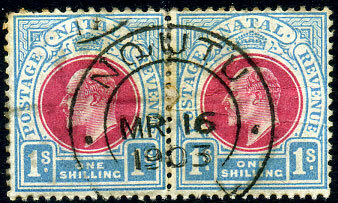 (Z.1) NO 28 87 on Natal QV 6d (SG.70) piece, some toned perfs. Recorded period SP 19 87 to DE 24 88. 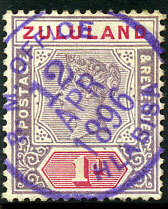 (Z.7) in purple dated 19 OCT 1899 on Natal QV 1d (SG.99a). 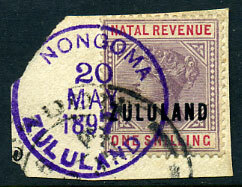 purple TRD dated 13 SEP 1898 on Natal QV ½d, 1d (SG.97a,99a) fragment. 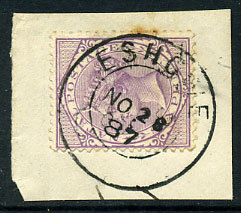 purple TRD dated 8 AUG 1897 on QV 2½d (SG.22). 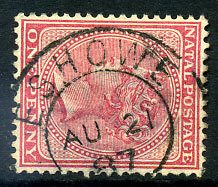 (Z.1, N.1) without country name at base dated AU 21 87 (ERD) on QV 1d (SG.99a), thinned. (Z.12) DE 2 1902 on QV 1d (SG.99a). 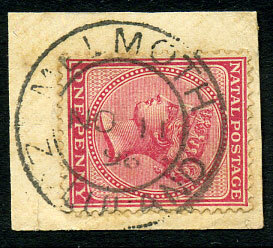 (Z.9, M.1) NO 11 96 on QV 1d (SG.99a). 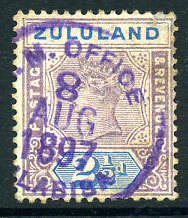 (Z.7) purple TRD dated JUN 11 189(8) on Natal QV 1d (SG.99a) piece. 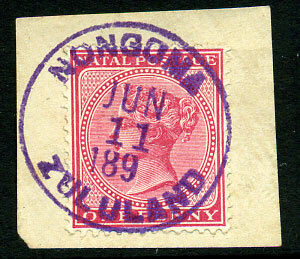 (Z.7) purple ink TRD dated 24 MAY 1898 on Natal QV 1d (SG.99a). 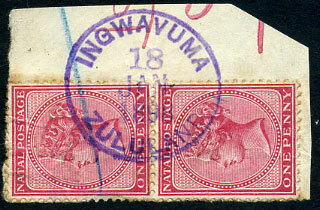 28 JU 97 on QV 1/- (SG.25). 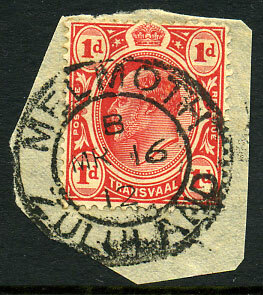 interprovincial use B/MR 16 12 on Transvaal 1d (SG.274). JA 8 12 on Transvaal 1d (SG.274).